How many unfinished books do you have lying around the house? One, two, maybe even half a dozen? I used to think it was just me, but then someone mentioned her stack of unfinished books and I realized that there were more people “out there” that suffered through the same dreadful, almost embarrassing, book-reading experience — or should I say non-book-reading experience. A bit of my ADD and a bit of my disappointment in books that received great reviews but weren’t really “great,” mixes with the demands on my time and before you know it, another book bites the dust and ends up with a bookmark or sticky on page 37 — clearly mocking my inability to stay focused through the disappointment or boredom and see it through to the bitter end. I know, I know: diligence is a virtue and one I have truly tried to apply to my reading endeavors. But there are authors whose works beat the odds and keep me interested, entertained, and/or enlightened to the very end. Those include the non-fiction works of Matt Swaim (The Eucharist and the Rosary; Prayer in the Digital Age) and Dr. Kevin Vost (Fit for Eternal Life; St. Albert the Great; Memorize the Faith! ); and the fiction works of Nancy Carabio Belanger (Olivia and the Little Way; Olivia’s Gift ) and Miriam Ezeh (The Story of Peace ). To this list I now add Anthony DeStefano. I’m new to DeStefano’s work, but he is the author of such best-selling books as A Travel Guide to Heaven and Ten Prayers God Always Says Yes To. 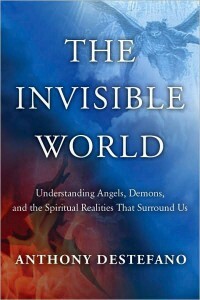 I’ve just completed The Invisible World: Understanding Angels, Demons, and the Spiritual Realities That Surround Us and was truly sorry to enter the last chapter and know that the end of the book was approaching. DeStefano tackles the issue of the “invisible world” in a convincing and passionate way. For die-hard Catholics, there may be a bit of a soft-sell on such topics as the Sacrament of Reconciliation or the Eucharist — yet he compensates by hitting a home run with such topics as grace and the very real existence of evil and hell and demons. It is clear that this book is written for a wider audience than just Catholic Christians and I applaud DeStefano’s ability to write to that wider audience while still appeasing those of us who want our books to be “Catholic” enough to honor and respect our teachings and traditions. He does this while also drawing in other Christians as well as, quite adroitly, non-believers. The Invisible World begins with a chapter titled “The Haunt Detective” and immediately references Father Frank Pavone (a Catholic home run for those of us who know and love Father’s work at Priests for Life) but easily moves into the sort of stories we all love to hear: the four-year-old who was miraculously cured of a brain tumor. DeStefano immediately delineates between a Judeo-Christian understanding of the invisible world and a new-age worldview, thus setting the stage for where he is going with the book. In the next chapter, when the author explores the reason for God’s invisibility, you can comfortably agree why God needs to be invisible, even if it never occurred to you to question why that is the case. Many of my unfinished books are books on angels. I want to know more about them and in DeStefano’s The Invisible World, I have finally read about them in a way that makes sense but also gives clarity, without going on and on with unnecessary or inane chatter. Kudos for the way that he explains angels and creates an understanding of the ways in which they help us and are accessible—and then moves on to the chapter on evil. This is followed by a masterful chapter on the soul which then leads to a chapter exploring the reality of invisible warfare. I found the author’s personal style and understanding of how to lead the reader from one point to the next to be very compelling. When he writes, “This is a real battle, with real casualties, being waged by real spiritual beings who really want to destroy us,” you sit up and take notice because he’s just explained what we have that is so valuable (our soul) and why the battle is being waged. The chapter on invisible warfare is followed by a chapter on grace which is, well, grace-filled! DeStefano weaves Bible stories and personal anecdotes throughout which give weight to what he has written. He references, and appropriately relies on, such great thinkers as Augustine and C.S. Lewis to make certain points. When DeStefano explores the power of suffering, I was reminded of my own on-going cross and found a bit of peace that I had not previously experienced. The book draws to a conclusion with chapters on destiny and seeing the invisible. The Invisible World by Anthony DeStefano is a wonderful book which I highly recommend! It will not gather dust on your shelf; in fact I already have in mind three friends for whom I will be purchasing copies and giving with great fanfare as I love to share such gems as this with those I know and love.